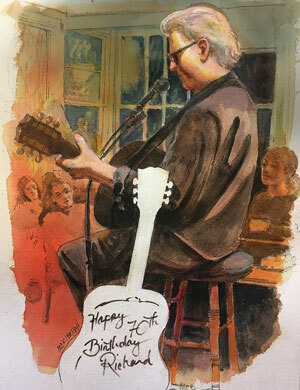 Thanks to everyone who came out last night and helped me celebrate my 70th. This drawing is by James McKiernan, thank you James. Many long-time friends (I didn't say old!) were there, many current and former bandmates, (see photos for names and bands), lots of my family were there, my niece Jessica from LaCrosse and nephew Jeffrey from Eau Claire made the trip down, and I couldn't have asked for a better party. Lots of memories shared over the years, lots of dancing, a few beers drank, and many friendships made. Thank you all for sharing my musical ride.